You may to be first and win this kit. It's enough leave under this post a little comment. who will receive my new kit. I love winter time and all the white, reds and greens. Great preview and anxious to see the entire set. Pretty pinecone. Love the peak - looks wintery without being freezing! looks brilliant! looking forward to kit! Thanks for the chance! Hi, sneake peak looks great :) thank for the chance.. Very nice. I can not wait to see the whole kit. very beautiful! Thanks for the chance! simply enchanting beauty is seen through openings! wanted to examine it more closely thanks for the chance! oh ! what a beautiful kit. Can't waite to see the whole thing. It looks so beautiful, thank you for the chance to win it! Beautiful colors and visible elements of the peeps :-) Thank you for the opportunity! Who what a beautiful colors are used here. And now I am of course very curious about the rest of the kit. I am curious about all the wonderful elements and paper what there is in this new kit. very interested in what this kit! Thank you very much for the chance to win it! I love the colors and can't wait to see the rest of the kit. I just know it is going to be fabulous. Thank you for the chance to win it. Oh my god, this one sure will be marvelous as well.I very much look forward to play with it. The perfect colors together. So warm and inviting. Love the sneak peak and would feel really lucky to win it. Thanks!!! I can't wait to see the whole thing... the tease looks great! Thanks for the chance to win! What is beautiful hides there!!! Thanks that give the chance to receive a scrap!! Beautiful kit! 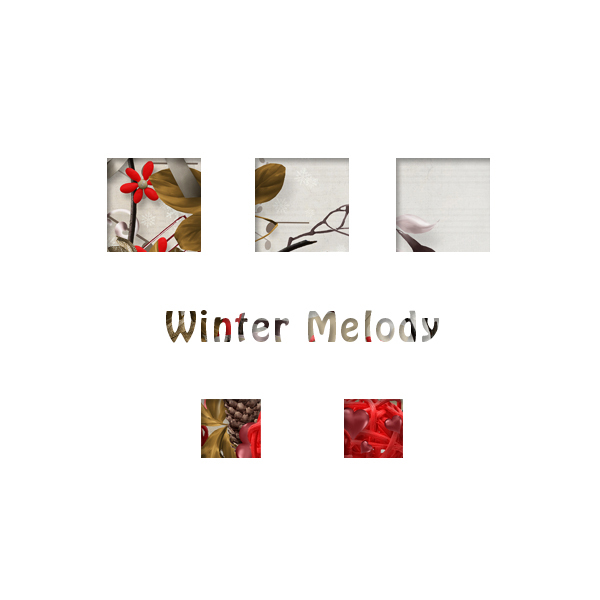 Winter melody so accurately describe the holidays! When the music plays, children are happy and the whole family together! And you can take photos and place your family abom on memory! And thanks for the chance!